High-speed, full-length grade printing at the out-feed of your planer, notcher or other moulding machine. Can be mounted to grade print linear or transverse traveling pieces. Pressurized inking system delivers continuous ink for consistent grade printing. No changing of pre-charged inking rolls. Low operating and maintenance cost. High-speed, full-face grade printing, top- or bottom-mounted before your stacker. Prints a single grade continuously. Pressurized inking system delivers continuous ink for consistent grade printing. No changing of pre-charged inking rolls. Low operating and maintenance cost. Used to mark on logs at the in-feed or cants at the head-rig, the Hewco Log-Max system is fully automatic and can be controlled by your PLC. This system can incorporate 1 to 8 guns using air pressure or pump action to propel the desired mark up to 137 cm (or 4.5 feet). Each gun can be independently controlled for a variety of marks. This system is ideal for identifying species and thicknesses from a distance. Hewco water-based F200 Logmax inks are available in a range of distinct colours. The most cost effective range of printers for your products. SIMPLE AND EFFICIENT. 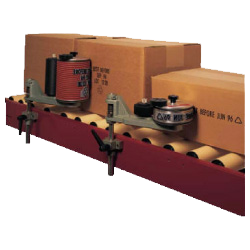 The Codapack printers all use replaceable pre-impregnated Plastic-Ink Rollers and interchangeable Baselock type. They are easily mounted to print on either the top, bottom or side of a product. These printers are widely used where zero down time is a necessity and lowest print cost per product is required. When only changing the code or best-before date once a day or once a week, the Codapack printers are the best. The Codapack 10K – 50K range of five printers are ideal for coding onto cartons or sacks, as the product passes on a driven or angled conveyor. Very often they are mounted inside a case sealer. The drive tires on the type drum are driven by the product passing, and a 360-degree cam registers the print on each product. The mounting arm allows the print position to be adjusted and the print pressure to be varied, especially for lightweight cartons. These printers can be mounted for left- or right-hand printing and can be supplied with either Metal Locking Rings (10-30K) or Interchangeable Sleeves (10-50K). The small, reliable Codapack MKIV – F/R is available with a standard free rotating 75mm diameter type drum fitted with Metal Locking Rings for either continuous marking or random printing on products. Three print heights are available. 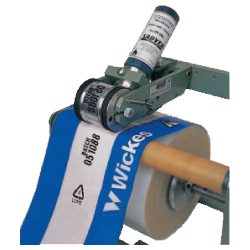 One or more sets of prints may be placed around the drum to ensure that a complete print appears on each product. The similar Codapack MKIV-C is available with a standard 360-degree cam type drum with Metal Locking Rings (90-degree, 120-degree, 180-degree cams also available), to give a registered print on small packets that are spaced apart. The print pressure can be adjusted. The Codapack SW printers are available with different diameters and print height type drums to suit the shrink wrap trays. The drum, fitted with Metal Locking Rings, is specially designed to mark low down on a shallow tray prior to shrink wrapping. The cam registers the print on each tray. Such as: paper, fabric, rubber, hardboard, linoleum, foil, plastic, metal, etc. The unit is simply attached to any parent machine. 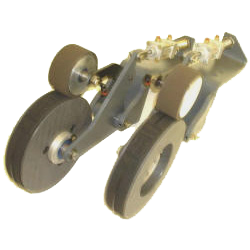 Type drums are suitable for use with Baselock type or flat stereos. Special fast-drying flexographic inks can be supplied to suit all applications. 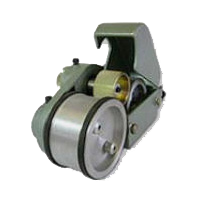 The type drum rotates by frictional contact with material being marked to give random or continuous print. Alternatively, a drive shaft may be fitted so that the type drum can be driven from a parent machine. The Codaprint is used to apply identification marks. Use-by dates, recycle logos, customer product names and more can be marked onto material that is continuously moving, or indexing, and where a repeat print is required. Some typical applications are on extruded film, bag printing, steel sheets, plastic window extrusions, shrink wrap film, cardboard core windings, Gypsum board, edge pack board, backs of mirrors and paper. The standard Codaprint type drum is fitted with metal locking rings for use with Baselock interchangeable rubber type. Baselock is available in many character styles and customised logos to enable a quick change of print. The type drum can also be made on request to suit 3.2mm flat stereos. Get clear and precise product marking efficiently and economically with the Codamark Pneumatic Reciprocating Printer. High speeds can be achieved with a low print pressure of 10-20 psi, enabling the Codamark to print with a light touch without product damage. Stainless steel components makes Codamark ideal for the food industry. 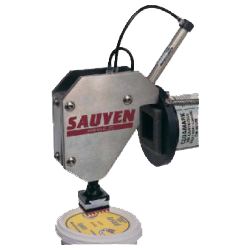 The print head is fitted with a type holder that can be changed in seconds. Spare holders can be used to pre-set Baselock rubber type. Special holders are available for recessed or concave surfaces. 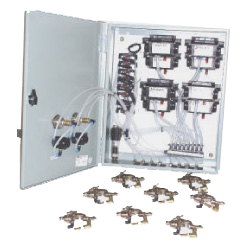 Three Control Modules are available, depending on the input signal used – pneumatic or electrical. Each has simple adjustments to optimise the print at speeds up to 180 products per minute. The small print head can be mounted at any angle to suit the product. Versatile mounting kits are available. The Codaprint is easily mounted on a fixed bar across the material to be marked. Vertical adjustment on the unit gives print on/off positions. 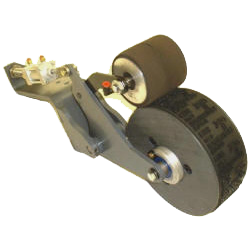 The printer is driven by frictional contact between the rubber tires on the type drum and the material.